In a new paper published in Scientific Reports, 4 more glaciologists (Rysgaard et al., 2018) report that “hot vents” (or hot springs) of geothermally-heated water underneath the Greenland ice sheet can explain localized rising temperatures and glacial melting. Water temperatures of these natural hot springs reach into the 60°C (140°F) range, and there are “several thousands“ of them “all over Greenland“, with observations of high geothermal heat/ice-melt locations spanning the East, West, North, South, and Central regions of this glaciated island. It’s instructive to put these subsurface hot spring water temperatures (reaching a sweltering 55-62 °C) into perspective. Greenland’s surface air temperature averages about -28 °C year-round, and the coastal water temperatures routinely hover around 0.0 °C (32.0 °F) during the summer. 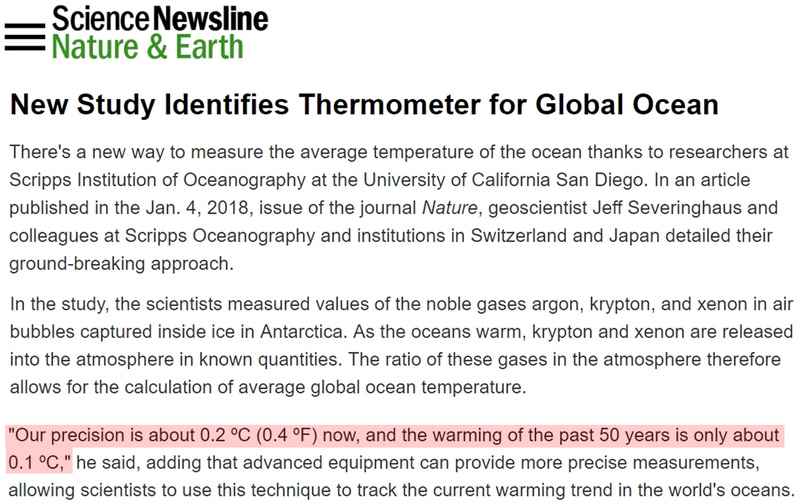 Consider that over the last 50 years the global oceans are alleged to have warmed by “only about 0.1°C” in total (Bereiter et al., 2018). That’s a change of one-tenth of one degree Celsius over 5 decades that climate scientists sympathetic to the anthropogenic global warming (AGW) cause claim could be heavily responsible for the change in Greenland’s glaciated landscape. Compare this tiny 50-year accumulation of thermal change to the range or variations in the natural, on-the-path-to-boiling heated water source directly beneath the Greenland Ice Sheet. Interestingly, the role of anthropogenic CO2 emissions in Greenland’s glacier dynamics is not mentioned in the paper. Consider these recently-determined scientific conclusions pertaining to the Greenland Ice Sheet. (a) Greenland was 3 to 5 °C warmer with 40 kilometers less ice area 4,000-10,000 years ago (Mangerud and Svendsen, 2017, Lasher et al., 2017, Kobashi et al., 2017). 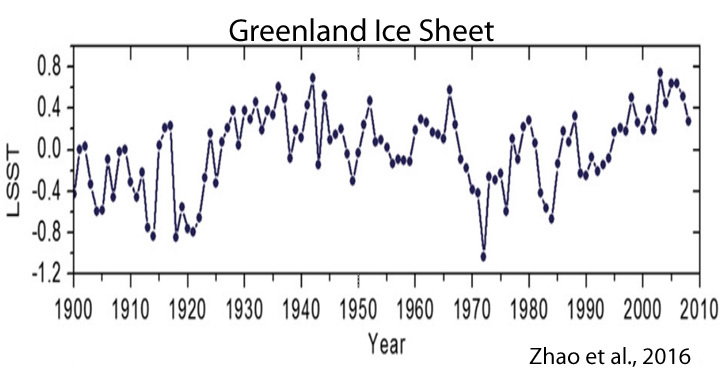 (b) There has been no net warming of the Greenland Ice Sheet in the last 80 years (Hanna et al., 2011; Zhao et al., 2016). (c) Melted ice from the Greenland Ice Sheet has contributed only 1.5 centimeters (0.6 of an inch) to global sea level rise since 1900 (Fettweis et al., 2017), with no (zero) net sea level rise contribution between the 1940s and the early 2000s. (d) Melted ice from the Greenland Ice Sheet contributed only 0.39 of a centimeter (0.15 of an inch) to global sea levels between 1993 and 2010 (Leeson et al, 2017). (f) Greenland has been cooling slightly since 2005 (Kobashi et al., 2017). 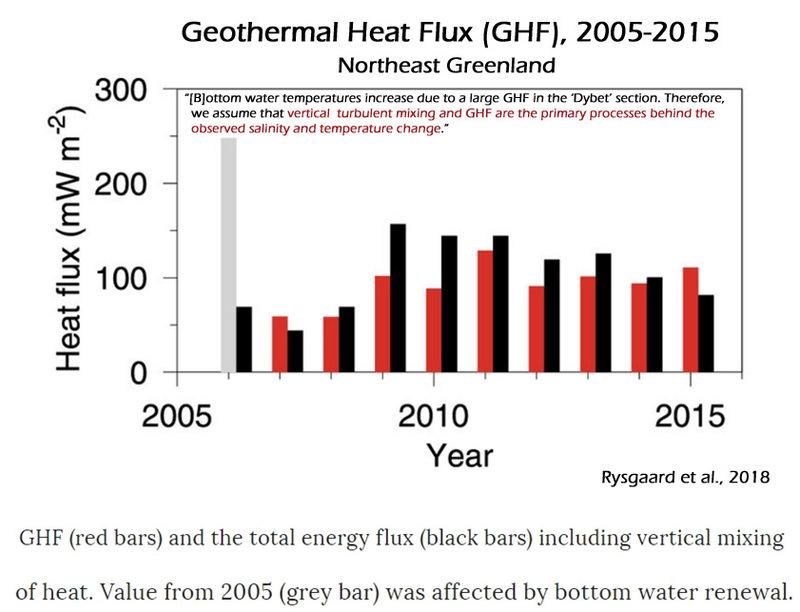 (g) And now it has been determined that the regional locations where warming and ice-melt has occurred on the Greenland Ice Sheet can be primarily attributed to high geothermal heat flux forcing. 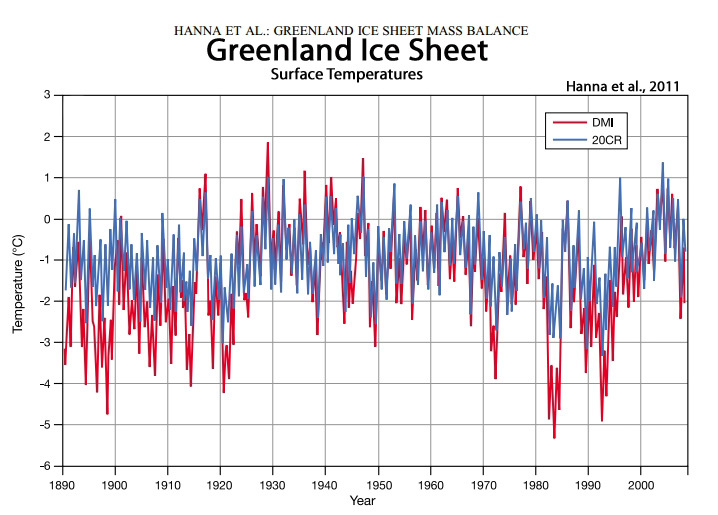 The scientific evidence continues to accumulate supporting the position that the Greenland Ice Sheet has not been following the modeled expectations of the anthropogenic global warming narrative. As a geologist, I certainly believe that deep water volcanic and hydrothermal systems are what controls the temperature of our oceans causing El Ninos as well as the ocean’s multi decade oscillations. However, in this study, there is no mention of the Medieval Warming Period from 1000AD to 1300AD when Vikings inhabited and farmed in Greenland. The Earth itself is providing far more to heat the ice cap than humans (*might*) have managed to do in the last 250 years- which corresponds oddly enough with the Deepest portion of the Little Ice Age. Greenland doesn’t seem to be noticing. The antarctic is melting too! It’s those pesky little aliens living under the ice and their warm everything up technology causing it.! I am very worried about this because my house is only 30 metres above sea level. So basically the geothermal heat flux is at least 10x greater than any climate change influence. Makes it rather hard to predict any change in ice mass balance as a result of climate “change”. However I suspect it won’t stop the fraudsters and rent-seekers from trying. I hope both of you know that it doesn’t require particularly hot temperatures for water to steam in a cold environment such as Greenland, right? Well that was a non-answer, even for you. !! How would you classify your reply, AndyG55? You did realize it is well below freezing at the time, Sebastian? Waiting for your sublime comment! STILL waiting for empirical proof of CO2 warming our gravity controlled convective atmosphere. Incredibly the coldest temperature ever recorded in the Northern Hemisphere was July 05, 2017 at Summit Station on GREENLAND. 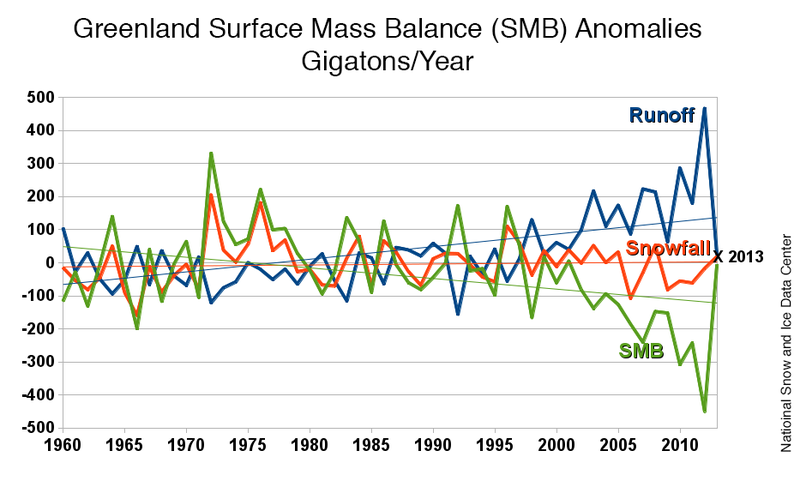 Additionally the mass surface ice budget is blowing away all records from the 1981-2010 averages. This was not predicted in the IPCC climate models. However just 6 days later (July 11, 2017), a pilot Ágúst Arnbjörnsson, during a flight from Keflavik to Portland, from a height of approximately 34,000 feet photographed steam venting from the Greenland ice field. The location is 75 km from Kulusuk Greenland. His image appears to show three plumes of steam rising from cracks in the glacier, which according to the blog of volcanologist Haraldur Sigurðsson, is 1.5 to 2 kilometers thick. This is, in all probability, signs of powerful geothermal activity from below the ice. Hello from a typical AGW skeptic. Playing the role of warming alarmism believer I respectfully request rebuttal of the following. Science of Doom’s sea level rise page assumes without specifically stating that the RCP 8.5 scenario with accelerated thermal expansion of ocean water and ice sheet melting due to atmospheric warming. Skeptical Science’s Greenland Ice Loss page shows scary melting graphs and probably also assumes the RCP 8.5 worst case scenario due to atmospheric warming due to the insulating thermal resistance property of additional co2 that due to conservation of energy requires lower troposphere warming to balance with outgoing long wave IR. 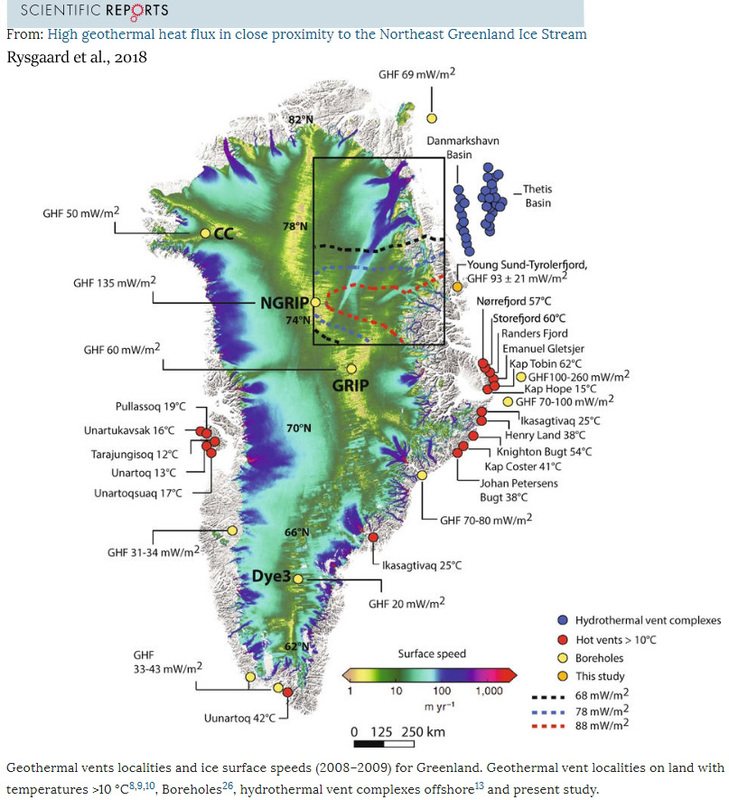 How then does Greenland Ice Sheet melt due to geothermal undermine the alarmist position since that doctrine’s scenarios do not include geothermal effects? Because that doctrine’s scenario claims that varying atmospheric CO2 concentrations in volumes of parts per million (0.000001) up or down over a body of water causes cooling or warming in that water body…even though this phenomenon has never been observed to occur in the real world. It’s a modeled conceptualization, or hypothesis. Put another way, no scientific experiment (real world, using physical measurements) has recorded a cause-effect change in water temperature due to airborne CO2 concentration variations. And do you not find it problematic that the emissions models don’t include geothermal heating as a factor in glacier melt? There’s a reason for that. The ocean’s control the atmosphere NOT the other way around. If the ocean is warmer than the air it will release energy to warm the atmosphere. If the air is warmer than the ocean , the ocean will release water vapour as evaporation to cool the air. This mechanism DOES NOT warm the ocean. Basically anywhere there are ice sheets , the temperature is well below zero nearly all the time. Only on rare occurrences, in the middle of summer (in respective hemisphere) do atmospheric temps get warm enough to actually melt the surface. RCP 8.5 is a nonsense construct based on nonsense assumptions, as there is no scientific proof that CO2 causes warming in our convective atmosphere anyway..
And that’s probably much milder criticism than it’s use/misuse deserves. Again a load of nonsense. CO2 does not have any insulating properties. If it did, it would be used in double glazing, but tests done in that industry show that CO2 is a worse insulator than normal air. All radiation in the CO2 band is absorbed in about 10m from the surface, changing the CO2 concentration would lower the distance to say 9.5m, but it does not stop the normal cooling action of the atmosphere. There is ZERO proof that CO2 causes warming in a convective atmosphere. Yeah, one that is slower than the usual cooling through direct radiation to space. Since it radiates in all directions and not only towards space. Physics 101. And? Is all that radiation energy then only going upwards? How sure are you about that? Every statement I said was provable TRUE. You have made ZERO counter. and don’t try that vague “physics” word. because you have proven time and time again that you know NOTHING about actual physics. You have NOTHING, seb, and your EMPTY responses PROVE it. I’ve made the same argument about how useless CO2 is as an “insulator.” It’s based on fact, not chatbot fiction. The physics doesn’t change based on the narrative the activists are pushing. As always, SebH mocks what he can’t refute. And he’ll NEVER give an actual scientific reason for anything, at least not a correct and/or consistent one. Oh oh, did he admit that CO2 radiates in all directions?! I thought it only radiated exclusively toward the earth. I guess it depends on which lie he’s telling at the time. You too, if you knew anything about physics and the mechanisms involved, you wouldn’t make that argument. It is ridiculous and I won’t repeat for the hundredth time why that is the case. As always, SebH mocks what he can’t refute. I am mocking those who will stubbornly refuse to accept reality in face of overwhelming evidence and who try to construct a different narrative that better suits their belief system. I still haven’t found out why most of the skeptics are so confused and bring up the ridiculous arguments they do. btw: what would you be trying to accomplish by using CO2 as insulation between sheets of glass? Would you like to block radiation in a certain frequency band or would you like to lessen the conduction between both sheets of glass? There is no reason to use CO2 for any of those applications. That being said, it is better at absorbing and re-emitting radiation than a pure nitrogen/oxygen gas mix, all greenhouse gases are. And by that nature it is insulating the surface from space. A conduit for radiation energy, sure … but a “slow” one. Refute that without mocking, I dare you! You are kidding me, right?! Why would I repeat myself in detail hundreds of times? You ignored the first hundred times, why should I expect that you’ll even try to understand the next time? There a FAQs for skeptics arguments out there which are perfectly fine and explain why most of your arguments are ridiculous. Ah, I forgot, you have to mock them because you can’t refute them … right? Seriously, what is wrong with you? Normally the skeptic side is arguing that it only emits to space, when did you change your mind? I can’t remember a single instance where I would have written that CO2 radiates exclusively to Earth. I can only think of one reason why you would think that I did, you don’t understand the mechanism and imagine one single CO2 layer emitting in all directions. Is that correct? So when someone says the what’s radiated back to the surface is more than what is radiated to space, you can’t understand why that is the case. Correct? And then you post links to websites with “divine intervention” written in diagrams (or was that sunsettommy, I don’t remember). NONE NADA.. That is the point. You remain as empty of any scientific proof for ANYTHING you say, as you always have been. Capiche??? ?….or does basic physics escape you AS ALWAYS. Off you slither, back to your fantasy, anti-science la-la-land, seb, where your so-called fizzics is a fairy-tale fabrication unsupported by any reality whatsoever. And we are STILL waiting for actual scientific proof that CO2 causes warming in our GRAVITY controlled convective atmosphere. Your ignorance yet again highlighted for all to see. CO2 emits only above 11km where the atmosphere is thin enough for thermalisation to be avoided, and the only effect is stratospheric cooling. Your grasp of even a very basic understanding atmospheric processes really is EXTREMELY POOR, isn’t it, seb. Well done seb, you finally took a tiny step forward. !! Convection and conduction govern the lower atmosphere. Now if you think just a little bit harder, you might get the next tiny step. Comprehending the basic physics of the atmosphere is genuinely difficult for you, isn’t it. All you see is a nebulous fuzz, with zero understanding. LOL – Sorry chatbot, but if we were as wrong as you accuse us of being and you knew why, you would explain. But you don’t because you can’t; not only because you lack the ability but because we aren’t wrong – at least nowhere near as often or extensively as you. You don’t have a clue what “the science” really says, and no amount of calling us names will change that. What it will do, though, is showcase your ignorance and deceit. So by all means keep playing the fool for everyone to see. And as to the “overwhelming evidence” that humans can control climate, there is none. Is that what you are reduced to !! Your brain-washed child-mind can never accept reality, so your self-mockery will be eternal. Once could destroy all you know about physics with a feather duster. Your physics/science knowledge is mere dust on the surface. Uuuh, I am trembling with fear … is that one of those “non-answers” you are writing about? Should we be impressed about your skills of which you have only demonstrated the trolling part yet? Still no physics or science to prove CO2 causes warming in our convective atmosphere. !! That is you continued NON-ANSWER. … just baseless brain-washed belief. physics and science, not in the mix. You need to get past your physics 101, seb. You show no inclination to do so, though. You seem to want to remain wilfully ignorant. Re-emittance time is several magnitudes slower than thermalisation time. Sorry if that is too much for you to comprehend. Quite frankly,seb, its becoming increasing obvious to everybody, that you don’t have the vaguest clue what the laws of physics say. They are an anathema to you, and you remain clueless. Um, SebastianH, we do indeed have physical measurements from real-world experiments that demonstrate the cause-effect properties of gravity on solid objects at a continuum of heights above the Earth’s surface. In contrast, we have no such real-world cause-effect experimental evidence or physical measurements that shows how little or how much (if at all) water is cooled down when airborne CO2 concentrations are reduced above them in volumes of parts per million (0.000001). Therefore, the assumption that we can cool the Earth’s oceans by reducing the atmospheric CO2 concentration is no more than conjecture, as it is based on modeled conceptualizations. Surely you know that the physics of gravity do have cause-effect measurements, but the physics of CO2-forced ocean heating/cooling do not have measurements. So why do you pretend that these physical constructs are one in the same and condescendingly imply that those who question the CO2-forced ocean heating/cooling conceptualization are marginalized deniers of gravity physics? In other words, why the dishonesty? Its all he has left, is why. All he ever really had. we do indeed have physical measurements from real-world experiments that demonstrate the cause-effect properties of gravity on solid objects at a continuum of heights above the Earth’s surface. As you are well aware, we don’t have any measurements for Alpha Centauri or any other star system. We assume that the laws of physics are the same everywhere. But, by your logic we can’t do that, we need to demonstrate that gravity behaves the same everywhere and until we didn’t do that, it’s just “modeled conceptualizations”. We do know the physical properties and the mechanisms. Those models aren’t based on some fantasy, they are based on what we know to be true. Those gases can’t just not do what they are supposed to do because some skeptics imagine it that way. They are. We know what happens because we know what the laws of physics say would happen. We can model lots of mechanisms in great detail and simulate what would happen. We don’t need to drop planet size masses into the Sun to confirm it, we just needed to observe the movement of way smaller masses. Same with greenhouse gases. You learn the properties in small experiments (done a long time ago) and you can extrapolate that to bigger systems like an atmosphere. The properties and laws of physics don’t change just because it is a bigger system. As you are well aware, we don’t have any measurements for Alpha Centauri or any other star system. Hmmm. When we talk about real-world measurements from real-world experiments, the world we are talking about is Earth. Again, we do have real-world measurements that tell us precisely how long it will take gravity to force a solid object back to Earth from a specified height above the Earth. In contrast, we have no such real-world evidence that shows how much (if any) cooling will occur in a body of water (any body of water—not just the oceans) when the CO2 concentrations in the air above these water bodies are reduced by __ parts per million (0.000001). Zero measurements. It’s merely a hypothetical conceptualization. You know this. You know we have physical, real-world measurements for gravitational forcing but none for CO2 forcing of water body cooling. So that’s why you disingenuously decided to bring up a different solar system. When your debate points (if they can be called that) are shown to be wrong (SebastianH: The effects of gravity aren’t measurable! ), you pivot to the irrelevant rather than acknowledge that you were wrong. No, that’s not my logic. That’s just you making up stuff again because you cannot acknowledge that you are wrong. We do know the physical properties and the mechanisms. It’s not about what is imagined these gases do to water body temperatures. It’s about what is observed. In the real world. And we have zero observations or physical measurements that show how much, if any, cooling will occur in a water body when the CO2 concentration in the air above it is reduced by ___ parts per million (0.000001). It’s a modeled assumption that these waters will cool. You can hurl your accusations all you wish for pointing this out to you again and again. No, we have physical measurements and observations from real world experiments that document cause-effect relationships between gravity forcing and its effect on solid objects. We don’t have physical measurements and observations from real world experiments that document cause-effect relationships between CO2 concentration changes and water body temperatures. This is why they’re not the same. And you know this, and yet you have decided to dishonestly claim they’re the same anyway. We know what happens because we know what the laws of physics say would happen. In other words, the logic[al fallacy] here is this: We “know” that CO2 concentration increases cause water bodies to heat up (and vice versa). The oceans have warmed since 1950. 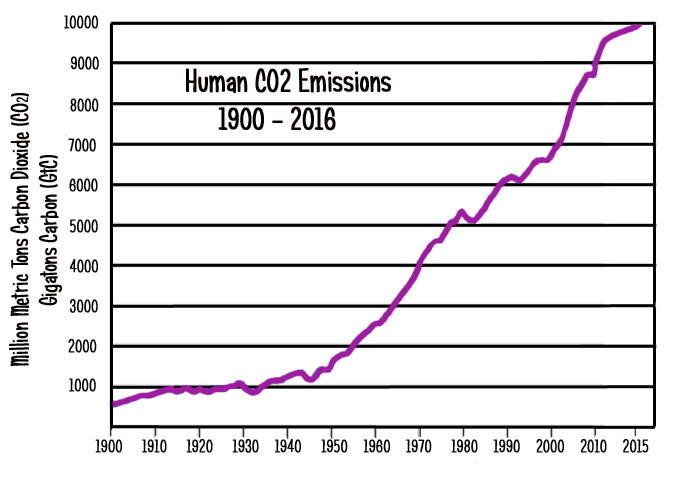 The CO2 concentration has increased since 1950. Therefore, the CO2 concentration increase caused the ocean temperatures to increase. Who told you what those gases were “supposed to do” ??? That is the comment of a NIL-educated brain-washed child-mind, not someone with any knowledge of science or physics whatsoever. And most properties of gasses are known, just NOT TO YOU, seb. The fact that SebH thinks we don’t have to continually question and test EVERYTHING is a red flag. Does gravity behave the same everywhere? Maybe. Maybe not. Is Relativity really correct? Looks like it, …for now. But the point is that it doesn’t hurt to ask. In fact, when you find a “science” that doesn’t allow you to question it (like AGW and Darwinism to name just two), you are dealing with something that is more religion than science. Yep, we all know that DIRECT EXPERIMENTAL DATA is an anathema and an enema to you, seb. Which you demonstrably DON’T. Sorry that basic physics alludes you. Yes, an El Nino will cause a small amount of warming, and limiting a study to such a short period of time during an strong El Nino, and thinking it actually means something.. that’s an AGW thing, isn’t it. ! In a strict mathematical sense this sort of statement does not work with the Celsius temperature, an interval scale. Switch the numbers to Fahrenheit and get a different result. The Kelvin temperature scale is a ratio scale because it has a unique, non-arbitrary zero point called absolute zero. Not the many readers will notice. Yes, the word choice was inaccurate…so it’s been changed. Thank you. I see no problem with it, as long as one realizes it refers to the halfway point between zero and 100 Deg C, or, after converting to Deg F, halfway between 32 and 212. And, since there’s a linear relation between heat content and temp in that range, what’s wrong about it? Seems you guys are overthinking this. It should also be mentioned that all this volcanic activity is going to make a mess of any gravity based ice mass measurements. OT, but this is funny, and absolutely PURE AGW crap !!! …..just to see what sort of idiocy they can get published.!! That’s how people get upset stomachs: eating “half-price – use-by date is at hand” sandwiches. I had better omit butter and marge. Carbon Footprint and all. That leaves me with the two slices of bread option. O.K. Make it one slice of bread, I’ll fold it in half. I like the meme pictured in a previous article. A bold statement, at least you now recognize that it is warming and that there is an accelerating ice loss. We all probably know what you mean by this, but 50°C only “halfway to boiling” if you consider 0°C “zero boiling”. How would you describe -100 °C in terms of percentage to boiling? Compare this tiny 50-year accumulation [assumed 0.1 degree warming in 50 years] of thermal change to the range or variations in the natural, halfway-to-boiling heat source directly beneath the Greenland Ice Sheet. Well, one person is talking about the entire volume of the ocean and the other thing is a highly localized warming. Of course, those differ in magnitude. To illustrate the difference you can go ahead and calculate how much the entire ocean would warm on average when you increase the temperature of the top 1 meter layer by 10 degrees. Maybe put it in a unit of energy … and compare it to the mW/m² of the assumed geothermal forcing below Greenland. Good luck! About the melting in general: you think that the accelerated melting in the past decades will not continue for a long time, right? Or rather that it is no problem because some scientific papers show that the ice sheet could have been even “lighter” in the more distant past. Is that correct? SCARED of the gravity based “trend” over an active volcanic region. Let’s look at even that nonsense trend in perspective shall we. Sorry that big number scare the mathematically ignorant, seb. but if could spend some time actually learning than posting nonsense, you might be able to overcome your issues in time. Yes, that is why parts of Greenland melt, highly localised warming. Your comprehension is seriously lacking today, seb, even more so than usual. at least you now recognize that it is warming and that there is an accelerating ice loss. It has been warming since the 1990s. 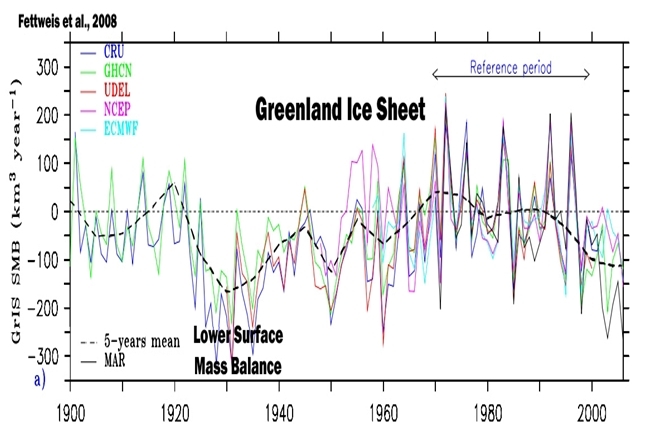 Prior to that, Greenland cooled and gained mass for about 40 years (1940s to 1980s). So when you write that “it is warming” and the ice loss is “accelerating”, you hopefully understand the oscillatory nature of this phenomenon, and, for example, that there has been no net warming in the last 80 years, or that the ice melt contribution to sea level rise from the Greenland ice sheet has been just 0.39 of a centimeter in total since 1993. Do you find an 0.39 cm ice melt contribution alarming, SebastianH? During 1900 to 1940, the Greenland ice sheet contributed 1.1 cm to sea level rise (Fettweis et al., 2017), and it’s only contributed 0.39 cm more since then. Do you think this falls outside the range of natural variability? Yes or no? We all probably know what you mean by this, but 50°C only “halfway to boiling” if you consider 0°C “zero boiling”. I’ll correct it, since it’s true it’s not semantically accurate. Correct. But the AGW narrative indicates that the global-scale CO2 concentration is what determines the temperatures of the global-scale oceans, with global-scale meaning that we add up all the regions where the oceans are cooling (Southern Ocean and Eastern Pacific since 1979) with the regions where it has been warming and we get a net change. And when we’re talking about global-scale net change of 0.1 C over 50 years (including the regions where it’s been cooling) vs. a variation in water temperature between 55.0 C and 62.0 C at a specific location where ice is melting, which do you think is going to be considered the “primary process” in the basal melting of that ice sheet? Would you really conclude it’s the “global-scale” warming of 0.1 C over the geothermal heat flux forcing? Of course you would. That’s why you’re a believer. If you are talking about water, as oppose to other phases of H2O, then greater than 50°C is indeed “more than halfway to boiling. Hey Kenneth, did seb ever provide proofs for CO2 warming the oceans, CO2 browning the world, and all the other anti-science LIES he has tried to propagandised? No, but I’ve decided to keep on hounding him to back up his beliefs with science anyway. I have a feeling that he doesn’t want to do this because (a) he doesn’t have the data, even though he says he does, and (b) much of his “data” comes from alarmist blogs, and he knows that citing them is anathema here. Would you please be so kind and actually calculate the temperature increase of the oceans on this globe when just the first 1m surface layers warms by 10 degrees. Can you put the assumend 0.1 degree warming in a W/m² figure and compare it to those mW/m² figures from the geothermal heat flux in Greenland? Do you find an 0.39 cm ice melt contribution alarming, SebastianH? The only thing alarming here is you guys. I’d be alarmed if the current acceleration in melting and increase in melt areas continues for another decade. Wouldn’t you be? Both show only a very brief time where the ice sheet actually (1970s/80s) gained mass. 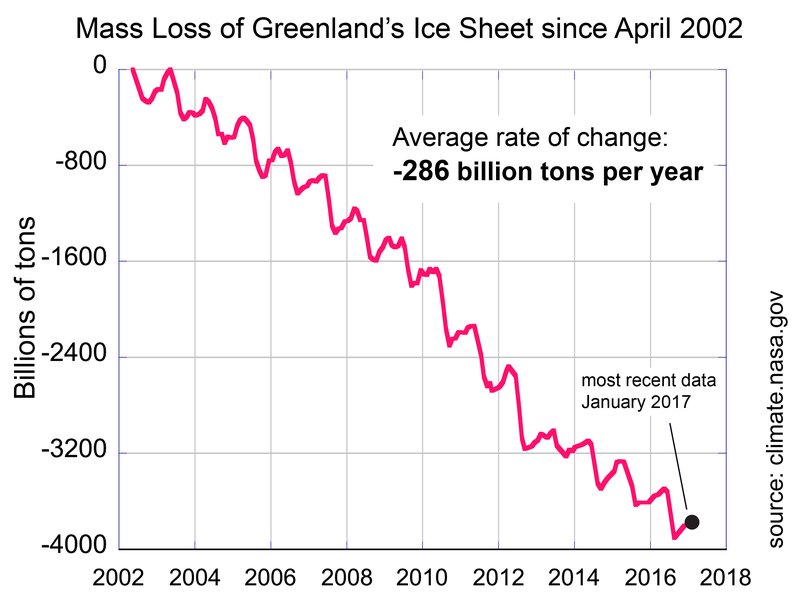 And again, as pointed out in the graph I linked to in the comment above, the average rate of ice loss was 286 billion tons / year since 2002. That seems to be higher than what happened in the 1930s according to Fettweis’ graph. I have a feeling that he doesn’t want to do this because (a) he doesn’t have the data, even though he says he does, and (b) much of his “data” comes from alarmist blogs, and he knows that citing them is anathema here. Or (c) you freely re-interpret everything to your liking and ignore what I write anyway. I hope you somehow see the irony of (b) … what people outside your bubble think of climate skeptic blogs doesn’t make you wonder if you should be more … skeptic about what you believe? According to Levitus et al. (2012), a 0.09°C warming amounts to 0.39 W m-2 of forcing. The heat content of the World Ocean for the 0–2000 m layer increased by 24.0 ± 1.9 × 1022 J (±2S.E.) corresponding to a rate of 0.39 W m−2 (per unit area of the World Ocean) and a volume mean warming of 0.09°C. Between AD 1000 and AD 1600-1800, ocean temperatures plummeted by -0.9°C (Rosenthal et al., 2013). What is the W m-2 forcing value for this cooling magnitude, and what was the causal mechanism that forced this cooling? Be specific. For that matter, between 1900 and 1945, ocean temperatures increased by 1.2°C in the 0-20 m layer…. …and since 1945 (through 2010), that same layer has only warmed by another 0.3°C. What was the forcing mechanism that caused global ocean warming to be 4 to 5 times greater in both magnitude and rapidity in the 1900-1945 period compared to the 1945-2010 period…since anthropogenic CO2 emissions were flat and low (1 Gt/yr) between 1900-1945, but then they rose exponentially after that? Please identify both the forcing mechanism(s) (since it wasn’t anthropogenic CO2) and the amount of forcing required to raise 0-20 m ocean temperatures by 1.2°C. When you refer to Fettweis, what graph do you refer to usually? Both [graphs] show only a very brief time where the ice sheet actually (1970s/80s) gained mass. I’m not referring to eyeing graphs. I’m referring to the text from the paper itself…which was referenced prominently in the article itself above. Why did you not bother to look at it? I’ll ask you again, since you failed to answer this question (again) the first time: Why did the Greenland ice sheet gain mass for 30 years (1961-1990) or fail to deliver any ice melt contribution to sea level rise for 60+ years (a “null contribution” from the 1940s-2000s)…all the while anthropogenic CO2 emissions were rising exponentially? Answer the question, SebastianH. What was the mechanism for these SMB trends? The only thing alarming here is you guys. Uh, SebastianH, you are the person who claims, without any data to back it up, that more than 30,000 species are going extinct every year, marine species can’t adapt to the alleged “acidification” rate of -0.07 pH over the last 200 years (-0.00004 pH/yr) even though pH varies by +/- 0.5 per decade, the Earth is browning/desertifying, crop quality is declining….because of rising anthropogenic CO2. And you think these claims (which you have yet to provide any scientific support to back them up) are not alarmist? We’re killing off 30,000 species extinctions per year with our CO2 emissions?! Painting yourself as a victim doesn’t help you here, SebastianH. We aren’t ignoring what you write. That’s why we keep on asking you to back up your claims of having “data” that supports your beliefs. And you keep on running away when we do. You pop in, take a dump filled with accusations and straw man arguments and unwarranted condescension, and then leave for a few days so that you can avoid answering our requests for substance. And then you claim that you don’t post substantively because AndyG55 keeps on calling you names. And this seems to be as good as it ever gets. Do you have any ??? You know, like empirical proof of CO2 warming in our atmosphere ! Or CO2 causing browning of the biosphere. …. or any other of your anti-fact lies and fantasies? That’s because what you write amounts to brain-washed anti-science propaganda garbage.. It is just your worthless opinions until you have some actual science to back it up with. Greenland ice area is just a tiny amount down from its highest in 8000 + years. The ONLY time it has been higher was during the Little Ice Age. THANK GOODNESS for the totally natural warming since then, wouldn’t you agree !!! That’s because you totally lack any historic understanding or reasoning. They are the anomalies, the NH ice sheets have had just a tiny recovery from that COLDEST of periods. Both are still WELL ABOVE what they have been for nearly all of the current interglacial. There is no reason except ignorance for your chicken-little Greenland ice panic. Only the most incredibly dumb person would want temperatures to drop back down to those of the LIA. Again the lack of comprehension, and seb “just making crap up”. IGNORE the facts, seb, its all you have left. No sign of any CO2 warming, anywhere. No proof of CO2 warming in our convective atmosphere. Its all just an unsupportable FANTASY, seb. Thx – I missed that! Some people believe that they can control the Earth’s temperature. Nearly all those people are in both camps. Thanks. Very informative. I have filed under “The Science is Settled”. I am still trying to find out what happened to the great Panthalassa Ocean (?most disappeared down a hole). The Wilson Cycles are still are a mystery to me. There is just as much BS in Plate Tectonics as Climate Science as academic dogma squashes debate. We do not now much of our Ocean floor still but the science is settled and heretics are banished. Sorry for my Sunday morning rant and being off the subject.